The growing popularity of spray foam insulation has only one negative side to it—it is being installed by amateurs and inexperienced contractors. Home and business owners must understand the hazards of hiring an installer without the right training for the job. This was highlighted by a CBC news story of a family whose home became virtually unliveable. Theirs was just one of the many instances of wrong installations in Ontario and North America. Wrong installation has in some cases been known to result in a gassy smell and cause breathing difficulties, as the family in the CBC story experienced. Lack of knowledge about building envelope issues can result in your contractor applying too much or too little spray foam insulation. This is a waste of time, effort and money. You are probably wondering how this could happen since spray foam is supposed to seal all leaks. But how will spray foam insulation work in areas where it was not applied? 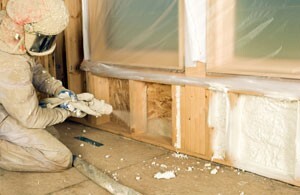 Poor chemical quality, high heat and improper application techniques can result in issues, such as the foam pulling away from the framing. This should never happen, as the insulation is designed not to sag and guaranteed to last for the lifetime of your building, when properly installed. Note: Spray foam should also never be applied in the presence of home occupants. It takes 24 hours to cure, and only then is it safe for you to come back into the property. Installers must also have the right safety gear while working. “Even the best systems will not work if they aren’t installed properly. Spray foam is no exception. It needs to be applied by a specialized installer,” says well-known contractor and TV host Mike Holmes who has been called in to fix some of the problems it causes. He cautions property owners against opting for cheaper quotes provided by technicians who are not qualified to do this work. You could end up with hundreds or thousands of dollars in damages, which are irreparable in some cases. With Platinum Spray Foam, you will have peace of mind knowing that our installers are manufacturer-trained. We wouldn’t take any chances with your property, or your health and that of our staff. Knowledge of building envelope and building codes enables us to provide valuable advice on insulation and avoid issues in the future. To learn more about our products and installation services, call Platinum Spray Foam at (416) 731-8600 or request an estimate online.